The circatidal rhythm is an endogenous rhythm corresponding to the tidal cycles, and its neural mechanism remains unknown. The mangrove cricket, Apteronemobius asahinai, possesses both circatidal and circadian clocks, and simultaneously exhibits circatidal and circadian rhythms in its locomotor activity. 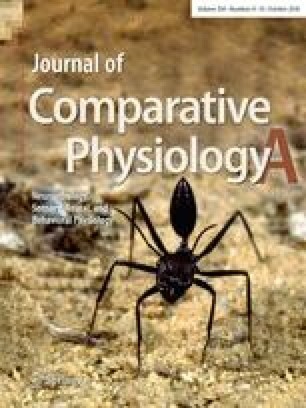 In a previous study, we showed that surgical removal of the optic lobes, the principal circadian clock locus in crickets, disrupted their circadian rhythm, but not their circatidal rhythm. In this study, we focused on the pars intercerebralis (PI) because surgical removal of the PI disrupts the circadian rhythm and causes arrhythmic activity in some cricket species. After surgical removal of the PI, the proportion of crickets displaying circatidal rhythm decreased, and more than half of the crickets exhibited arrhythmic activity. Surgical removal of the regions around the PI also caused a similar effect on locomotor activity. Our results indicate that the PI and/or its surrounding regions are important not only for circadian but also for circatidal rhythm. This suggests the presence of a neural or hormonal pathway in the PI and/or its surrounding regions that is common to the circatidal and circadian rhythms. The online version of this article ( https://doi.org/10.1007/s00359-018-1281-1) contains supplementary material, which is available to authorized users. This study was supported by a Grant-in-Aid for JSPS Research Fellows to HT (Grant numbers 13J04819 and 17J03649). All procedures performed in studies involving animal care and collection were in accordance with laws, ordinances, and the ethical standards of our institution and government.